Since we love both sweets AND all things paper, we’ve whipped up a few fun ideas for your kids’ school valentines that combine the two—and of course, we’ve also got a cute gift idea for school teachers as well! 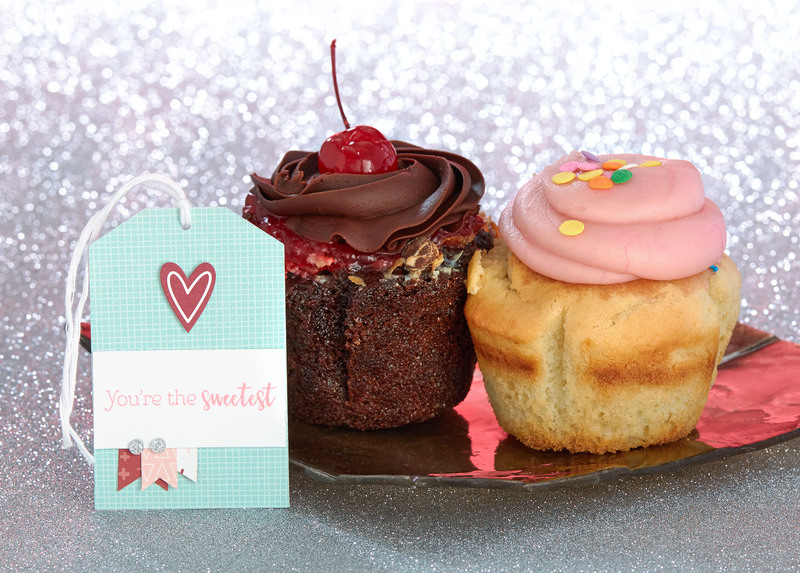 For these Valentine’s projects, we turned to our treat-themed Sugar Rush papers and embellishments. If you’re looking to make lots of cards for your kids’ classes, try making smaller 3″ x 3″ cards. Small cards will help make your paper stretch further, and you can decorate them much quicker! Attach a treat to the inside or back of each card, and you’re set! We chose to use the Emojis stamp set because we wanted our cards to be playful—and what could be better for that than silly faces? 🙂 To round off the cards, we used some of our Sugar Rush Complements and dots, which perfectly match the papers. Easy peasy. Have fun “testing” your kids’ candy while designing your own mini card designs—and maybe even let your kids get in on the fun! 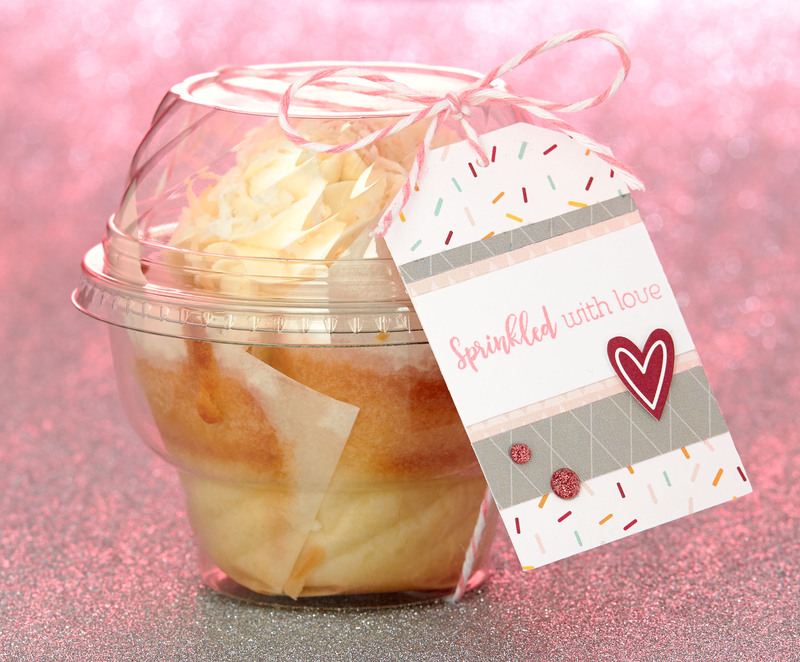 Don’t forget to give those school teachers something sweet, too! A little thoughtfulness can go a long way! How about a cupcake with a cute tag? This tag uses our Sugar Rush—Cardmaking stamp set, which has sentiments that are perfect for pairing with desserts. Deck the Halls with Papercrafting! December is here, and you know what that means—it’s party season! Whether you’re celebrating Christmas, New Year’s Eve, or other special celebrations, you’re bound to host at least one festive event soon, and Close To My Heart wants to help make your party the cutest one on the block! First let’s welcome in Christmas —or rather, let this Christmas banner welcome your guests in! For this banner, layering is the name of the game. Chocolate cardstock letters behind their Cranberry counterparts create a shadowed look, and the holly leaves appear beautifully real thanks to two layers in different colors of cardstock. And of course no party is complete without some cupcakes! Our Cricut® Artiste collection includes all sorts of cupcake liners. Some glittery stars make great cupcake toppers and tie all of these pieces together. The stars were cut out of gold glitter paper with the help of our Cricut® Artbooking collection, and they really make this trio the perfect ensemble! But even if your party isn’t for Christmas, we’ve got you covered! If you’re celebrating New Year’s Eve, a birthday, or something else entirely, then the Kaleidoscope paper packet is your new best friend! This banner is certain to brighten up any room it’s in (even on the coldest winter nights! ), and it’s perfect for celebrations all year round. To get this look, attach strips of paper together (so they have the same pattern on each side), and stitch them in a long line with your sewing machine. Voila! 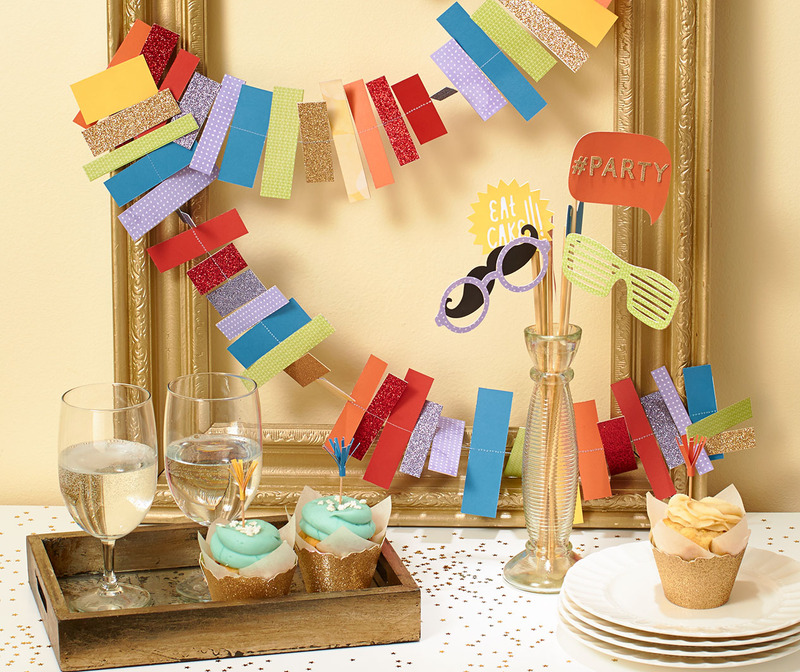 The party centerpiece here is just as spunky as the banner! In addition to being a great decoration, the decorated sticks could be used for super fun photos, party games, or favors. 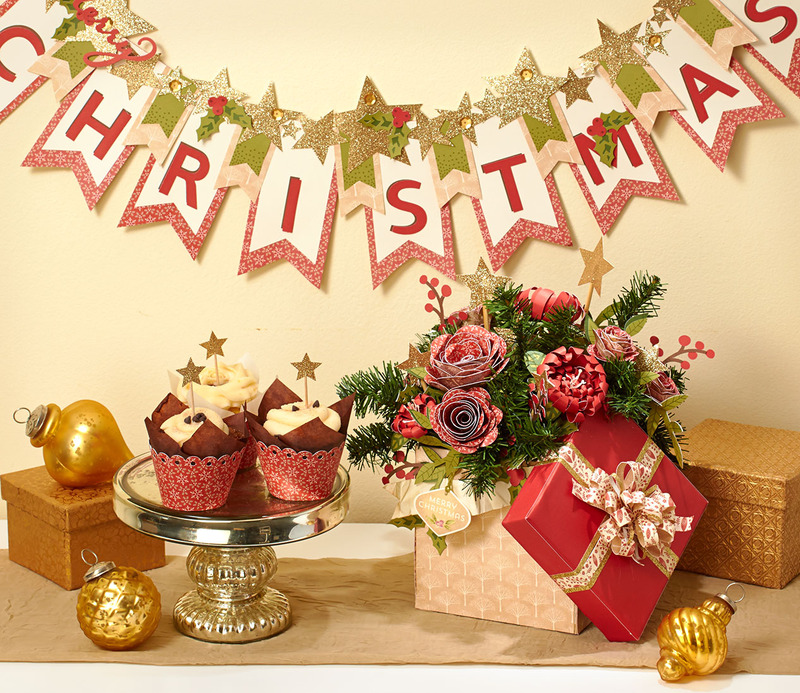 And just as it added class to our Christmas pieces, our gold glitter paper is back! These liners have a non-glittery paper on the inside of the liners to keep the glitter on the outside! The cupcakes are topped off with spunky little tassels of cardstock, cut and glued around the tops of toothpicks. They look kind of like fireworks, and they’re just the thing to “spark” a conversation with your guests. We know you’ll enjoy creating these beautiful pieces of artwork—and we know you’ll love the compliments that will follow, too! No matter what you’re celebrating in the coming weeks, may all your celebrations be merry and bright!